Innovation & creativity Fashion Fringe made us want to weep with joy. Spooked: Now that it's October, we're already review our ideas for Halloween Costumes (stay tuned for more ideas). If you're looking for a romantic and fabulous period costume, check out our Etsy Shop of the Week, Romantic Threads. Shopped: Fall is in full force. We've shopped for all things velvet and found affordable and colorful fall clothes from Target. Jael's been on the hunt for the perfect red lipstick, and we want to know if you love or loathe this boot. Fashioned: This week's episode of Project Runway was a tear jerker, but emotions aside who do you think will make it to fashion week? 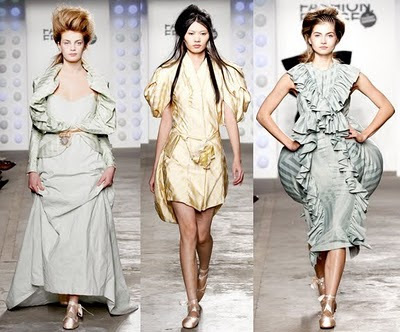 Speaking of Project Runway and fashion week, do you think Christian Siriano's latest work is living up to his potential?